Abstract. Diversification of ecology into subdisciplines that run from macroecology to landscape, community, and population ecology largely reflects its specialization on different segments of the spatial gradient over which recognizable ecological patterns and processes occur. In all these cases, the elemental units involved in the patterns and processes of interest to ecologists are individuals from the same or different species. No distinct flavor of ecology has yet emerged that focuses on patterns and processes revolving around the lowermost end of the spatial gradient, which in the case of plants corresponds to the within-individual domain. 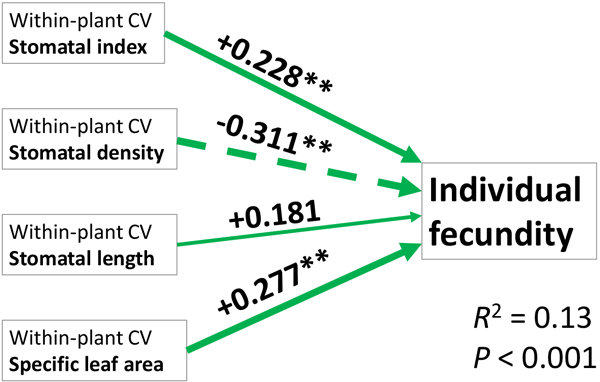 Intraindividual heterogeneity in organ traits, however, is quantitatively important and has multiple consequences for plant individuals, populations, and communities, and for animal consumers as well. 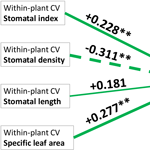 This paper first provides an overview of current knowledge on plant traits that vary subindividually, the magnitude of subindividual variation, and its spatial patterning. Examples will then be presented on the consequences of subindividual variation for plants and animal consumers at individual, population, or community levels. Finally, the recently emerging links between genetics, epigenetics, subindividual variation, and population ecology will be illustrated using results on variation in seed size, a functional plant trait playing an important role in plant population dynamics. Further observational and experimental studies are needed which link ecological and phenotypic measurements of plants to their epigenetic and genetic characteristics, in order to understand the three-way relationships between subindividual variability, genetic features, and epigenetic mosaicism. Another proposed line of inquiry should focus on evaluating whether subindividual epigenetic mosaics eventually translate into epigenetically heterogeneous progeny, thus contributing to the maintenance of population and community functional diversity. How to cite: Herrera, C. M.: The ecology of subindividual variability in plants: patterns, processes, and prospects, Web Ecol., 17, 51-64, https://doi.org/10.5194/we-17-51-2017, 2017.